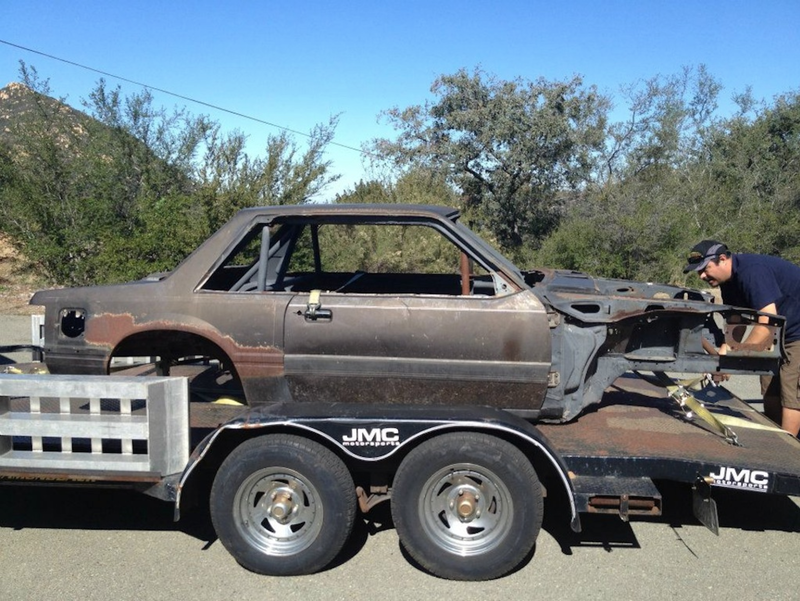 Spotted On throtl - The Baddest Fox Body Mustang....EVER??? Creations N Chrome's Berzerk 1986 Ford Mustang For Sale on throtl. This has got to be one of the most extensive street legal Fox Body Mustang builds ever created. And we are here to tell you a little more about it. Being that the builder is Gary Watson of Creations N Chrome (CNC) in Santa Clarita, Ca and a long time friend of our own marketing dude, Mickey Andrade we have had the privilege of hearing all about this car, many times. Instead of just saying, "Yo, this thing is for sale on throtl and here's a link to check it out" we thought maybe we'd throw together a few photos and some information for you to check out here. As you can imagine with a build of this magnitude it likely started life in a very broken down state in order to mock everything up. You will be shocked when we show you how this beauty began life. Well, there ya have it! About as nasty as it gets. But, when you are planning to do a complete "tear-down" and rebuild sometimes locating a chassis in this state can actually save you some effort. This particular chassis as Mickey recalls was pretty ragged and already "caged" with what would eventually be replaced with superior materials and workmanship by the craftsmen at CNC. This photo was taken the day CNC picked it up down in San Diego and dragged it back to Santa Clarita some years ago. 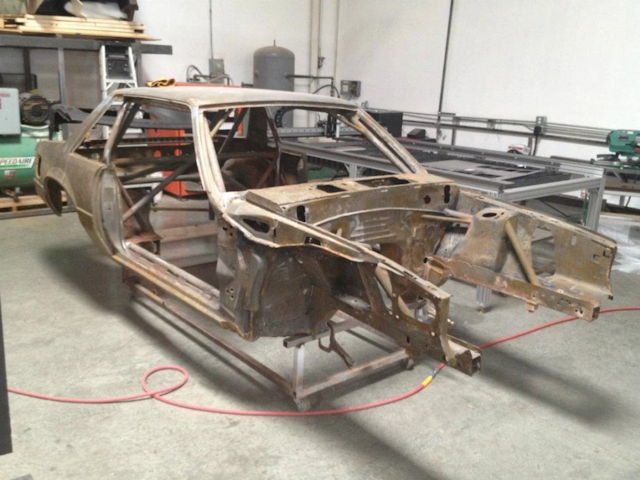 Once back at the CNC compound the car was given a solvent bath and stripped of all unnecessary sheet metal. 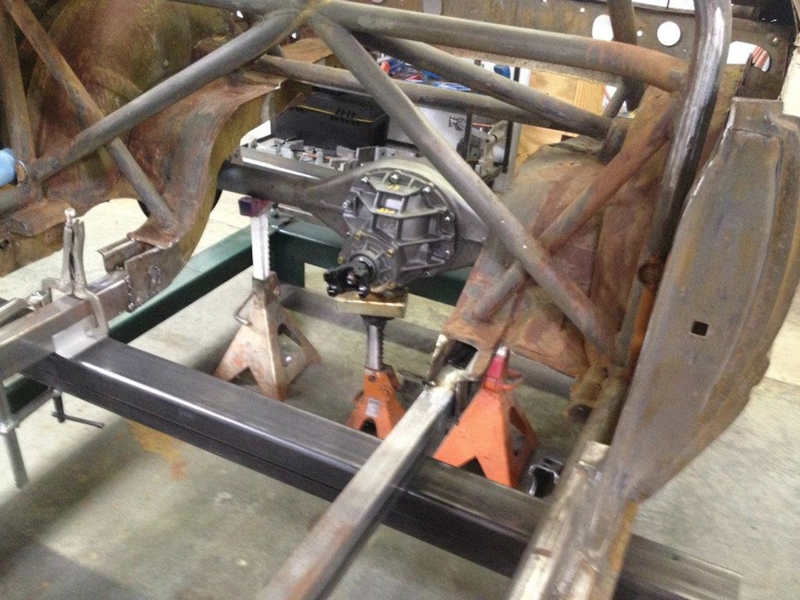 The substandard roll cage was kept around for structural rigidity during metal work phase. We love seeing cars in this state! Once all the mock up was done the car was then taken back apart, media blasted and then powder coated gloss black for a great look durability over paint. CNC was planning a forced induction modern Ford Performance 5.0L Aluminator crate engine and once calculating the drivetrain components and unique billet JME cantilever front suspension it was apparent the OEM firewall was gonna have to be moved.....er...removed. By modifying the firewall the engine could be moved waaaay back in the chassis (18 inches!) and help with that pesky weight distribution. It's quite amazing really once you realize how far back the engine has been placed. Just look at it! 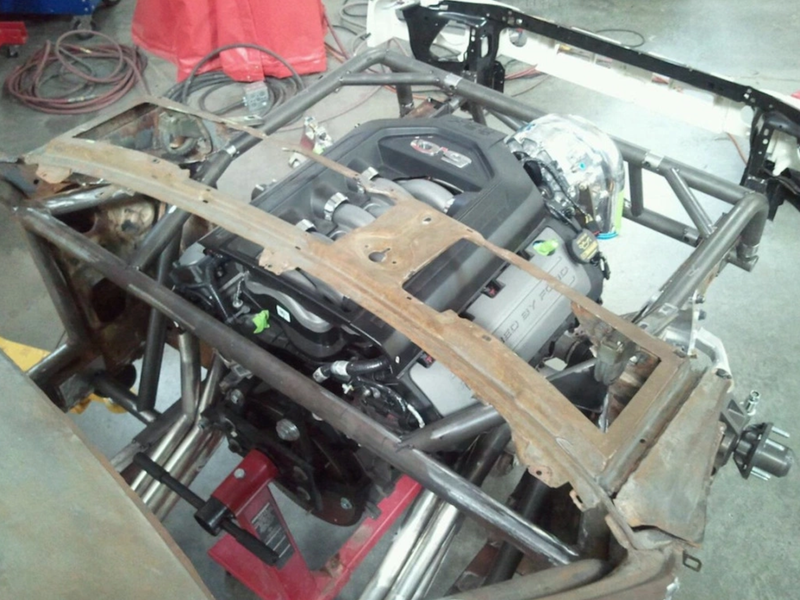 With the cancerous floor pan removed you can see the amount of work and dedication required to make this build happen. 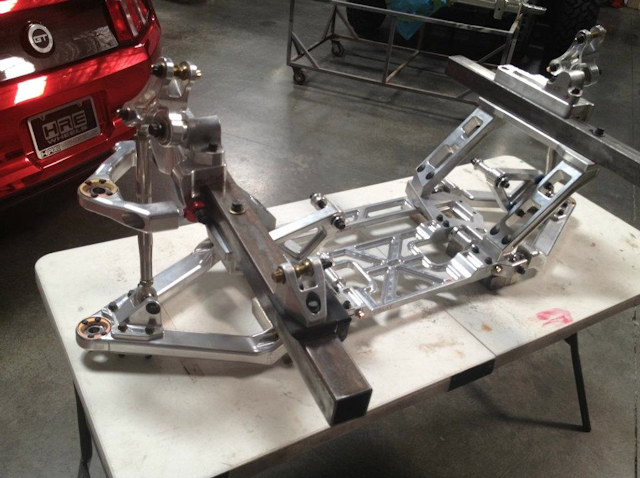 CNC added new boxed frame rails connecting the front of the chassis to the rear for added rigidity. The remainder of the drivetrain consists of a G Force 5 sp. dog box, paired with a triple disk clutch and Curry 9" rear end. Here you can see it mocked into place utilizing S197 rear suspension geometry and capable of handling the 855hp/667ft/lb of torque that it would see upon completion. 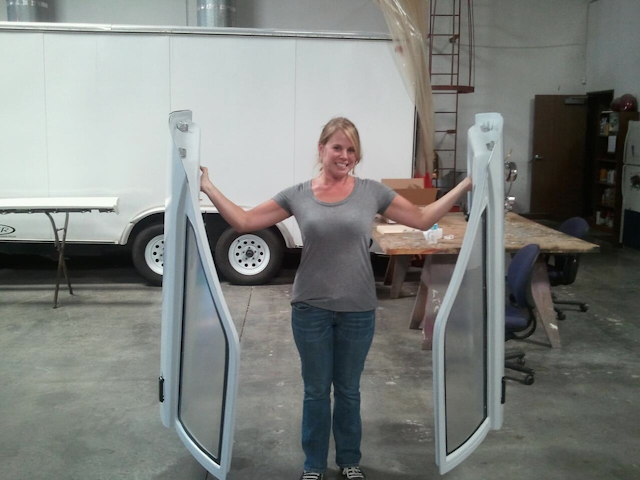 Motor City Solutions specializes in dry carbon body components and was tasked with supplying the doors, bumpers, hood and trunk that fit as if they were OEM. The composite widebody front and rear fenders were then sourced from Meier Racing and completed the lightweight body treatment. It should also be noted that no expense was spared on this build. As you can see here, this car has no "hose clamp" type fittings on any device transferring fluid. In fact, CNC confirmed the bill for the -AN fittings for the car were well over 10k. CRAZY! This write-up only scratches the surface of the time, money and componentry put into this project. And after watching as CNC crafted this "Top Notch" first hand, it is our opinion that no one has ever built a finer 1986 Fox Body Mustang street car. We are beyond excited to have it listed on throtl for sale to all of our awesome users. See the full listing here.